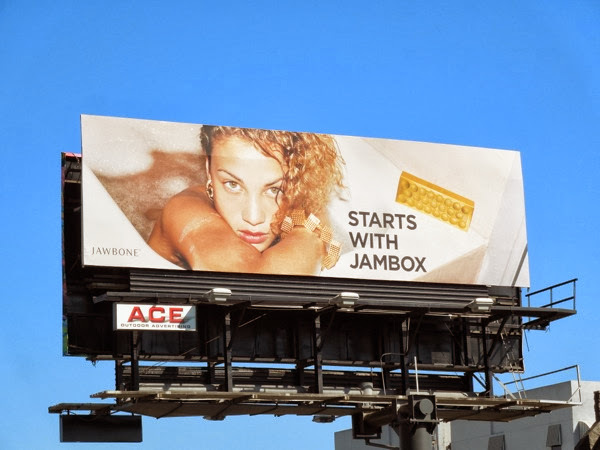 A few things sprung to Daily Billboard's mind upon first seeing these 'Starts with Jambox' billboards. Firstly, what the heck is Jambox, or Jawbone, for that matter? With the young female models, are these ads for a new jewelry or fashion line? And if so, isn't it a bit late in the fashion season to be having a girl modeling a bikini in a swimming pool? 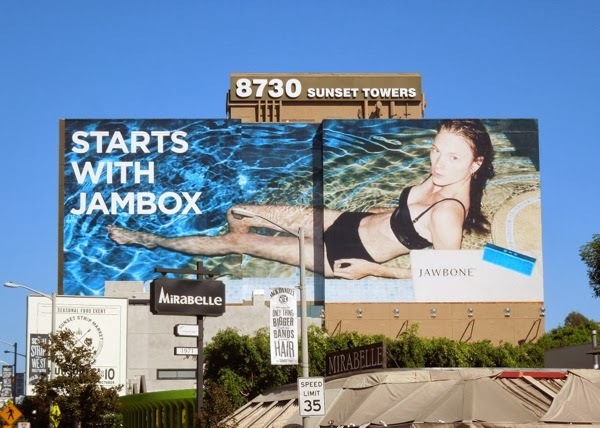 With all that being said, they are quite arresting and eye-catching visuals, especially the giant-sized swimming pool creative along L.A.'s busy Sunset Boulevard. The ads are in fact for Jawbone's wireless audio speakers, and best of all the sleek Jambox device can be customized in the colour combinations of your choice. As this product is all to do with music it stands to reason that the technology brand would want to position its speaker product along L.A.'s infamous Sunset Strip, which is well known for its music heritage and credentials. Both billboards were spotted along Sunset Boulevard on September 30, 2013, perfect timing really for the fast-approaching gift-giving season.